The marketing landscape has been rife with creative masterstrokes in previous weeks, with a lot of leading-brands being on top of their game, displaying some of the best creative marketing in March. Stealing the show this month, we’ve got KFC’s genius PR cover-up, followed by world-class creative advertising by Vodafone. We’ve also seen the rise of Lloyds Bank’s latest inspiring campaign in partnership with Mental Health UK. However, if film is your bag, the Oscars treated us to a tour down memory lane with its classic Hollywood-inspired ads. All this and more below! When KFC announced the closure of some of its UK stores due to a chicken shortage, press articles were laden with biting criticisms and humiliating comments. In response to this, KFC’s creative agency Mother developed a full-page print apology around a play on the fast-food giant’s three-letter acronym. It comes as no surprise that PR crisis-management can often be a strenuous game of push-and-shove to try and balance a wavering reputation, sometimes to no avail. A few years back, you might remember the perceived slander around McDonald’s and what really goes into their food. In a bid to bust these myths and regain customer trust, they released a series of adverts putting the record straight. 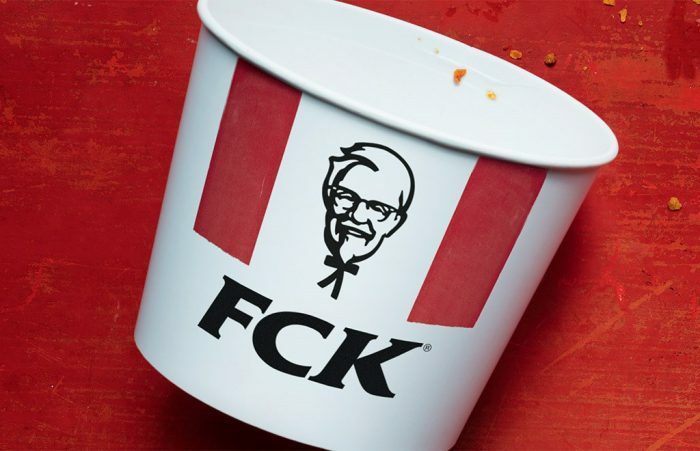 In the same vein, KFC’s print “FCK” ad demonstrated in a simple yet effective way how to ‘laugh off’ your blunders. Aligning with their slogan “By Your Side”, the latest campaign by Lloyds Bank seeks to address the stigma surrounding those living with mental health issues. By teaming up with Mental Health UK, the ad brings to light the culture of silence, encouraging people to speak up about mental health conditions. It features a selection of celebrities, such as Professor Green, Rachel Riley and Jeremy Paxman, along with members of the public and bank employees. They’re all engaging in a “Who am I?” style game to explore misconceptions surrounding mental health conversations. Gaining trust is one of the most powerful things a brand can achieve, so it’s a thumbs-up to you, Lloyds. The Oscars are nowhere near the Super Bowl in terms of advertising costs, but it’s certainly up there. With a price of up to $2.6m per spot, the Awards were most likely the most anticipated of its shows for a long while. While there are a considerable amount of highly-anticipated films out conveniently in-time for the Academy Awards, Hollywood-movements such as Time’s Up and #MeToo can be deemed partly-responsible for its popularity. What’s more, this year saw the Academy Museum of Motion Pictures celebrating Hollywood’s past in a Stanley Kubrick inspired ad. The star of the ad is The Shining’s classic Overlook Hotel, borrowing original footage from the Kubrick Estate in order to arrive at a surprising, creative, and visually impressive campaign. “It was our goal to deliver to [the Academy] a multi-dimensional campaign that was as surprising, crafted and smart as the museum itself,” says Jason Kreher, Wieden + Kennedy’s creative director of entertainment and editorial. And what better way to stage the arrival of this campaign than at Hollywood’s biggest night; the Academy Awards. For Valentine’s Day this year, One Love Foundation – a charity initiative which provides support and information about abusive, unhealthy relationships – created a shop around all of these red flag signs. The items sold in the store included a bear which when pressed says negative comments such as “I hate you” followed by “I’m sorry, I didn’t mean that” as a demonstration of emotional abuse. There was also a GPS tracker disguised as a necklace pendant to show controlling behaviour. Serving as an extension of the Foundation’s #LoveBetter campaign, each gift represents the warning signs of abuse. Excellent use of shock tactics here and a success in raising awareness for signs that are often difficult to spot. Paris Fashion Week came to an end last week, and with most brands launching their Fall collections, Lacoste launched its limited-edition shirts. Deviating momentarily from its trademark crocodile logo, the clothing brand has opted to instead replace the logo with ten endangered animals. The number of shirts available for each animal represents the amount of animals are left, for example 67 for the Javan Rhino. This proves for a great way to bring creativity in support of a real world issue, demonstrating brand values alongside IUCN’s Save Our Species programme. Martin Freeman has been Vodafone’s muse for a while now, and it seems these adverts just keep getting better. This is the next instalment of the brand’s campaign which seeks to demonstrate its pledge to deliver seamless, high-speed home broadband. What we see here is celebrity endorsement at its best; riding off the back of the success of Black Panther, Freeman’s action-reputation is at an all time high. That, coupled with his trademark dry humour makes for a great ad that’s both visually entertaining and amusing, too. That’s it for this month! However, be sure to keep an eye out for some of our other marketing picks through updates on our Twitter and LinkedIn channels. What did you make of this month’s entries? Feel free to get in touch directly and let us know!